A ruler foot is mandatory for this class- we will have feet available for purchase and will talk about the foot choices and take time to fit the machines with feet if needed during the class. If you have a newer Bernina, you’ll need to get the Bernina #72 ruler foot ahead of time. Quality thread in two contrasting darker colors. Anything you use to set up for free motion quilting like a Sew Slip matt, Supreme Slider, etc. A selection of quilting rulers to stitch with near the end of class. 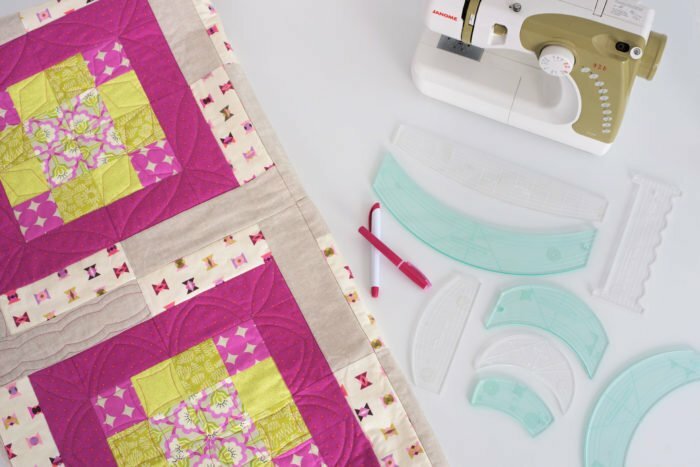 During this class, we will learn about the importance of a ruler foot for quilting with rulers, how to choose rulers for your machine and projects, best practices when using a ruler with free motion quilting, and a variety of basic ruler work designs. If there’s enough time at the end of the class, time can be taken to experiment with specialty rulers.